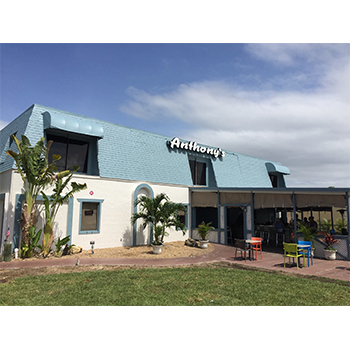 Originally opened in 2007, Anthony's on the BLVD was started by Anthony "Tony" Serrago. He opened the landmark Cape Coral building with the idea of providing personal service while serving up great food for reasonable prices. Specializing in American, Italian and Seafood, we offer lunch and dinner daily. Our award winning Sunday Breakfast Buffet has over 16 items, FREE coffee and made to order omelet station. Over the years, Anthony's on the BLVD, has become well known for its daily specials, exciting entertainment schedule and community events. A proud member of the local community, Tony believes in supporting those around him. He believes in making every experience for patrons personal and enjoyable, always exceeding your expectations. Valid on Dinner Menu ONLY after 4pm.